The sun unleashed an M1.5-class solar flare (lower left) on July 3, 2013, a solar fireworks to the traditional Fourth of July holiday in the United States. 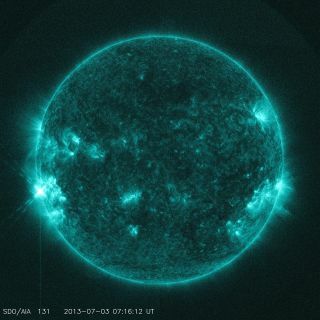 The sun fired off an intense solar flare Wednesday (July 3), giving NASA scientists a solar preview to the Fourth of July holiday in the United States. The solar flare erupted at about 3 a.m. EDT (0700 GMT) and was spotted by NASA's Solar Dynamics Observatory, which snapped a photo of the July solar storm. "Just a few minutes after 7:00 UT, the sun produced an M1.5-class solar flare. Perhaps an early Fourth of July fireworks?" SDO mission officials wrote in a Facebook post announcing the flare. M-class solar flares are medium-strength solar storms that can supercharge Earth's northern lights displays when they are aimed at Earth. NASA officials reported that the July 3 solar flare erupted from a point just over the eastern side, or limb, of the sun, so it was not directed at our planet. The most powerful type of solar flares are X-class sun storms. When aimed directly at Earth, X-class flares can pose a threat to astronauts in space, interfere with satellite signals and potentially affect electrical power grids on Earth. Wednesday's flare followed close on the heels of a dazzling sun eruption on Monday (July 1), which sent a tendril of super-hot solar plasma dancing over the surface of the star. The SDO spacecraft captured a video of that solar prominence, as scientists call the events, in spectacular detail. The sun is currently in the middle of an active phase of its 11-year solar weather cycle. The current weather cycle, known as Solar Cycle 24, is expected to reach its peak this year. NASA's SDO spacecraft is one of several spacecraft monitoring the sun to track solar flares, plasma eruptions and other space weather phenomena. The $850 million observatory stares at the sun continuously to create spectacular high-definition videos of solar weather in different wavelengths of light.